When docent Rob Sansom walked into the Ely Stage Stop and Country Museum for the first time and saw the little bar that had been set up all he could think of was, “What a cool place this would be to have an old-timey drink!” With that idea in mind the Ely’s “Cocktails in the West” program began – historic cocktails in restaurants that capture the history of Lake County. In most depictions of the Old West saloon, whiskey was the drink of choice but there was a thriving cocktail culture during Victorian times. “Professor” Jerry Thomas is the most well known of the Victorian mixologists of the day as he is one of the few that wrote anything down. Armed with “Professor” Jerry Thomas’s recipes, sourced by David Wondrich in his 2007 book “Imbibe”, there were some simple cocktails that one might have encountered at the Ely Stage Stop. The menu for “Cocktails In The West” include the Champagne Cocktail, Whiskey Cocktail (predecessor to the Old Fashioned), Manhattan Club (the original Manhattan), the Saratoga and the Sherry Cobbler, a quite refreshing beverage for the summer! The three participating restaurants in our Cocktails In The West promotion are the Blue Wing Saloon in Upper Lake, the Saw Shop Gallery Bistro in Kelseyville and the Boar’s Breath in Middletown. Each building has it’s own history. The Blue Wing Saloon Restaurant in Upper Lake, adjacent to the Tallman Hotel, is a recreation of the original 1880’s saloon that was demolished during Prohibition. 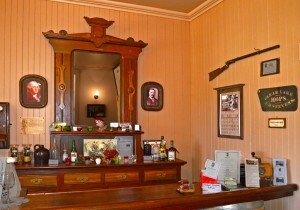 It captures the spirit of the Victorian saloon with it’s Eastlake back bar and Lake County black walnut bar top. The Saw Shop Gallery Bistro in Kelseyville is housed in a 1906 late Victorian period building with some of the architectural details still intact. During it’s life as a boarding house and private residence it has been home to many of Lake County’s ancestors, past and current. The bar was milled from Lake County black walnut too! And finally there is the Boar’s Breath in Middletown. The oldest of the three buildings, the corner brick building has housed a turn of the century general mercantile (Cannon Bros.) and the original “Corner Store” now known as Hardester’s. The Blue Wing, Saw Shop and Boar’s Breath are looking forward to serving everyone some historical spirits! So starting the week of July 15th stop in to any one of these establishments and order up a cocktail that Black Bart might have enjoyed. If you want the recipes, stop by the Ely Stage Stop and Country Museum to purchase recipe and history booklets! Cheers! For more information, www.elystagestop.com, www.facebook.com/elystagestop, elystagestop@gmail.com or better yet stop by and see us! 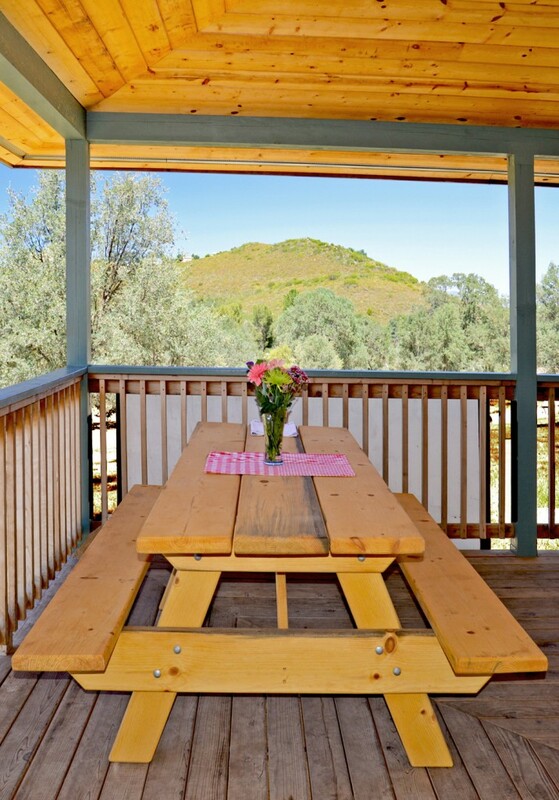 The Ely is located at 9921 Soda Bay Road in Kelseyville and is open on Saturdays and Sundays, 11am to 3pm, or call us at 707.533.9990 during business hours. QUICK! It’s time for the 2013 Ely Quick Draw. 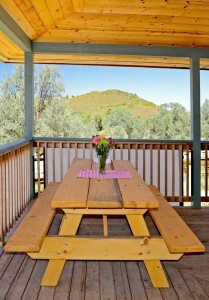 This is your chance to win a fabulous wood picnic table and bench set for your outdoor entertaining needs. Beyond-sturdy two inch thick solid wood was used so it will last a very long time. The set was made right here in Lake County, USA, by the Konocti Conservation Camp CC#27. Known for their fire suppression support and community service projects, the camp has donated this great piece for a raffle to raise funds for a set of tables that will greatly enhance Ely’s event space for future festivities. The 2013 Quick Draw ticket sales started July 6th. The autumn drawing date will be announced at a future time. So buy early and buy often. Tickets are $5 each or 5 for $20. Purchase tickets from our docents during museum hours, 11 a.m. to 3 p.m. every Saturday & Sunday or from any of our volunteers anywhere/anytime you may run into them. Watch for us at many public events. Operated by the Lake County Historical Society, the Ely Stage Stop and Country Museum is located at 9921 Soda Bay Road in Kelseyville. Visit our websites at elystagestop.com or lakecountyhistory.org, as well as www.facebook/elystagestop. 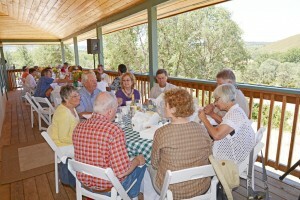 Attendees of the June 22nd Ely Stage Stop and Country Museum’s first annual Picnic on the Porch had a wonderful time. Greeted by old time music performed by Uncorked (Don Coffin, Andy Skelton, Eleanor Clark, and Dan Harris), everybody got in the mood quickly. There was toe-tapping, hand-clapping and even some dancing in the parking lot. Barbara White modeled a typical traveling woman’s outfit she would have worn riding the stage line. Other period clothing was on display inside the house as well as on the porch. Old fashioned aprons and teapot collections were on display compliments of several Lake County Historical Society members who are local historians. Select pieces of their collections were loaned for the day’s event. Both displays were very impressive, taking guests back to another time. A delicious box lunch catered by Rosey Cooks was enjoyed at noon on the porch. 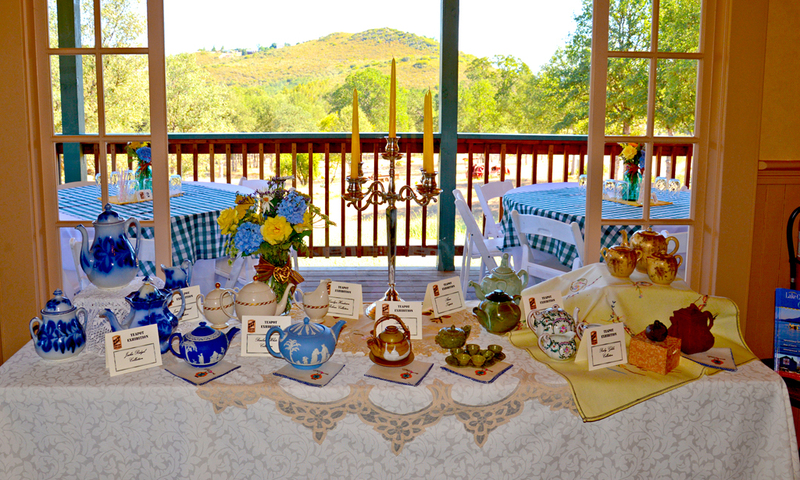 Docents provided an elegant setting for 80 guests. White linens accented by green checkered tablecloths adorned each table. 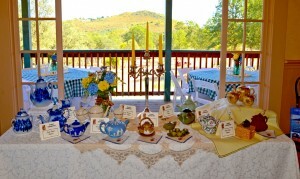 Fresh floral arrangements in green Ball mason jars were offset with yellow linen mats complimenting the country decor. The weather was perfect for al fresco dining that day. After lunch seven themed baskets were raffled off. 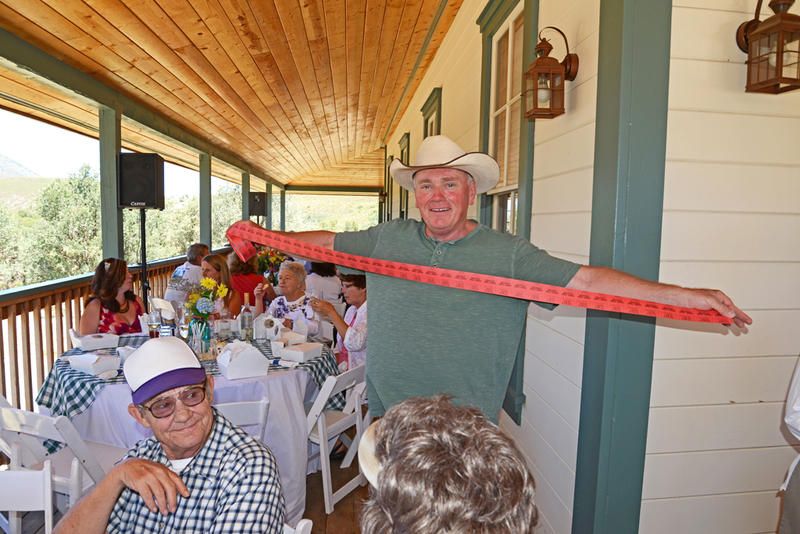 District 5 Supervisor Rob Brown helped to encourage raffle ticket purchases in the final minutes with his own version of the “stretch”. Silent auction items continued to collect bids during the lunch and raffle. Winners were announced as each item closed. 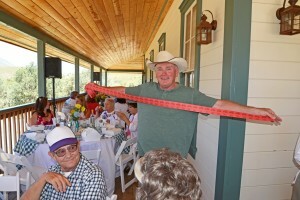 Guests were encouraged to self-tour the new barn where several agricultural pieces were displayed. Items in the barn and on the grounds had been smartly labeled to help with their identification. Seating for Ely Stage Stop events is always limited so remember to get a ticket early when the next event is announced. It would be a shame to miss it! Be sure to visit the Lake County Historical Society’s and the County of Lake’s newest museum. The museum address is 9921 Soda Bay Road (Hwy 281) in Kelseyville (near Clearlake Riviera). Current hours of operation are 11:00 AM to 03:00 PM each Saturday and Sunday. Visit our websites at elystagestop.com or lakecountyhistory.org or visit us at www.facebook\elystagestop.